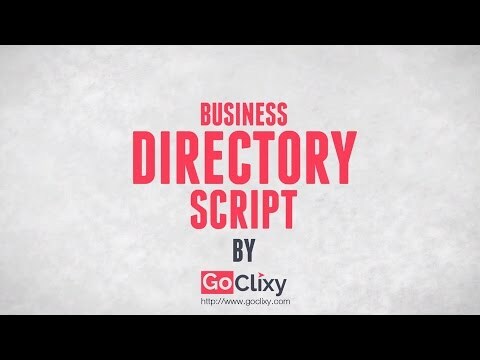 GoClixy is a PHP based business directory script which provides an option to easily import and export categories, users and listings. Now there is no need to worry about data entry operations. Simply create an excel file and remaining work will be done automatically. Our business directory software simplifies internationalizations. Enable languages through the Admin Panel and build a strong relationship with your customers by displaying the contents of your directory in their native language. GoClixy is the first business directory software which provides option to add locality information along with City, State and Country. Now user can also search in a particular area. With the help of category manager, you can add, modify and delete categories and subcategories. You have option to add SEO information like meta title, keywords and description to each category. It is now easy to create, modify and delete users. Multiple users can be activated and deactivated on a single click. Administrator can sort users alphabetically or by their roles. GoClixy supports more than 40 payment gateways. Find a payment gateway which suits your business and offer your customers the convenience of paying in your currency. Allow your business directory visitors to share business information via SMS. By default, GoClixy is having only Nexmo and SMS Global integration, if you are having another one, then share this information with GoClixy Team and we will get back to you with the integration. A module that allows you to customize your directory themes through the Admin Panel. You can add widgets to your directory pages to extend its functionality. Simply copy and paste the widget code in your theme pages and it will be shown on your website. Q. Are you using any templates to easily customize the front-end? GoClixy has templates and they are based on Bootstrap CSS files. You can modify them as per your requirements. Q. Can we change or modify some parts of the code? In Business and Standard Editions, the core files are encrypted, you cannot change them, however, Company is distributing theme files with full source code, you can customize the design as per your requirements. Q. Can I migrate data from my existing directory to GoClixy? Yes, you can easily migrate data to GoClixy, GoClixy have tools to simplify the conversion process. Some of the conversion may cost you additional, depending on the number of listings and the format of the data. Q. Can I run GoClixy on a directory or a subdomain? You could run GoClixy's script on a sub domain or in a directory. Just send your hosting credentials to GoClixy and Goclixy will do the free installation for you.